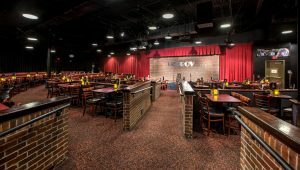 The Ontario Improv is an ideal setting for corporate events, wedding receptions, business meetings, fundraisers and more. The venue can seat up to 350 patrons and offers a variety of food and cocktail choices with easy parking in the neighboring mall. With the latest in technical capabilities including a stage projector wall, the club can facilitate different types of presentations, as well as support both live music and DJs. Near both Orange County and Los Angeles county with a major airport and hotels close by, the club is an ideal setting for your next event.